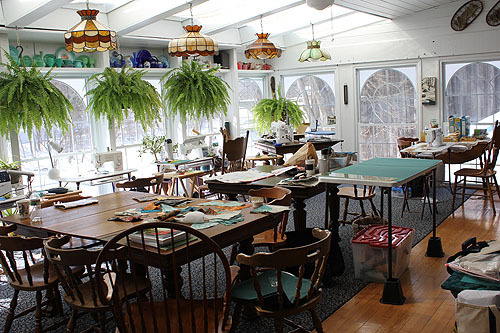 The first weekend in March I spent a wonderful weekend away quilting in Henniker, New Hampshire. A few of my friends (well, there are 5 of us) discovered the Henniker House Bed & Breakfast last year. The B&B has five guest rooms as well as a beautiful open great room overlooking the Contookook River. Innkeeper Kate generously let us spread out our sewing machines, fabric, and the rest of our quilting stuff – and leave it there! – all weekend. Add home-cooked breakfasts every morning and a great quilt store – Quilted Threads – conveniently located right next door, and it made the perfect setting for serious quilting and ‘away’ time. Last year we stayed for the weekend, and this year we decided a longer 3 day weekend was in order. What a treat! 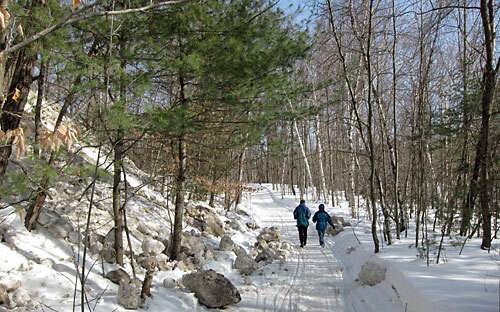 Despite the snow, the weather cooperated so we took a break from quilting to walk along the river and check out the nearby trails. We brought twice as many projects as we could work on. We cut, measured, pieced different types of blocks including two sets with curved seams, hand applique’d, and knitted. We used the floors in the larger rooms as design walls. 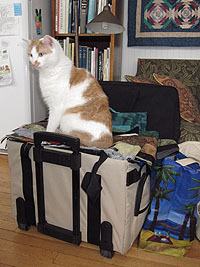 And – what quilting retreat would be complete without a pair of feline sewing supervisors? 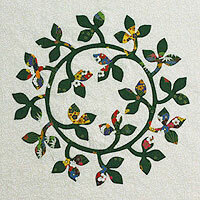 One of my favorite quilt shows is A Quilters Gathering, held in early November every year in Nashua, NH. I entered one quilt in the show, and my friend Karen entered a small quilt that Karen and I collaborated on – she made the top and I quilted it. The show was this past week and weekend, November 4-7, and we were thrilled and honored to receive an award for Machine Quilting Excellence for our little quilt May Tulips! Do any of you listen to Annie Smith’s quilting podcast, “Quilting Stash – the first podcast for quilters“? I am a great fan and have been enjoying her podcast for years, so I was intrigued with her new online classes. 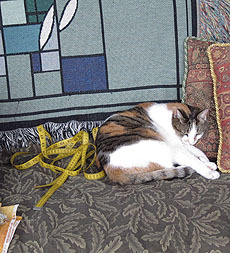 Especially when I found she is offering a class on her “Quilters Palette” quilt – I have always loved this quilt, and she has never published a pattern for it. So, I signed up for the class, and it is really fun! The class includes high quality video instruction in addition to written handouts, and a weekly online chat with Annie. Check it out – you can follow the link to the Quilting Stash Classroom at the right, or find out more about the Quilters Palette class here. We started the class by selecting fabric for our quilt. Annie asked us to pick a focus fabric, and then choose 16 fabrics that blend well with the focus fabric, and provide sufficient value contrast for the quilt. I decided to use all solid fabrics for this quilt. I have been using solids almost exclusively for the past year, and this gives the the opportunity to experiment mixing solid cottons and cotton sateen, silks, and cotton/silk blend fabrics in a single quilt. It was a challenge to pick out the fabrics – the range of solid fabrics (and ones I have in my stash) is much smaller than the range of prints today! The first block we made was the Dresden Plate block. It uses all of our fabric choices and becomes the fabric ‘palette’ for the rest of the quilt. The block is sewn together, but not yet appliqued to the background fabric. Stay tuned – I’ll be posting my blocks here as they are completed. I hope I can keep up with the weekly lessons! I had great fun making a carrying case for Baltimore Album (or other) blocks this weekend. I’ve wanted to make this project for years, as I have watched friends carry their applique blocks in these beautiful and sturdy cases. I was pleased to have the opportunity to take a class (taught by my friend Karen Pessia at the Quilted Crow in Boxborough, MA) which made putting the case together a snap! The case is made out of fabric-covered foam core boards cut to size, and some of the construction is a bit tricky. We received great directions and tips that helped us all speed through the sewing. Half of the class had their cases finished by the time they went home. The basic pattern for this block carrying case is available in Baltimore Elegance, by Elly Seinkiewicz. The sample in the book has an embroidered monogram and suggested applique embellishments to the case as well. I decided it was a perfect opportunity for some machine quilting instead. I made a small quilted (and trapunto’d) monogram in a solid fabric which I added to the front of the case. If I make another case, I would add more machine quilting to this smaller case, for additional stability. The next time you are working on a project that calls for embellishment, consider machine quilting as an alternative to embroidery or applique. Small machine quilting projects like these are excellent practice, easy to quilt and fast to finish, and a great way to show off your love of machine quilting! Now I need to start working on some blocks so I can use this case!